on the previous post I highlighted the new feature of VPLEX 5.1, let’s get to the main dish..
RecoverPoint offers flexible RPOs with dynamic synchronous and asynchronous options to allow customers to customize RPOs based on criticality of their data. It’s flexible enough to replicate between VMAXe arrays, VMAX to VMAXe, VMAXe to VNX, VMAXe to CLARiiON and even from VMAXe to non-EMC arrays. Whatever the topology, VPLEX and RecoverPoint provide application-level consistency and recovery for federated, clustered, physical, virtual, and private cloud environments. The VPLEX RecoverPoint Splitter allows customers to take advantage of the best of active/active configuration with high availability and mobility, together with continuous data protection and remote replication. Only solution to provide High availability, mobility and operational/disaster recovery across 3 sites. Offer “Game changing” solution which has Point-in-time copy and disaster recovery support for virtualized storage. Fine grained operational recovery capability on VPLEX Local virtual storage. In case of primary site disaster, customer can recover to any point of time at the remote site. 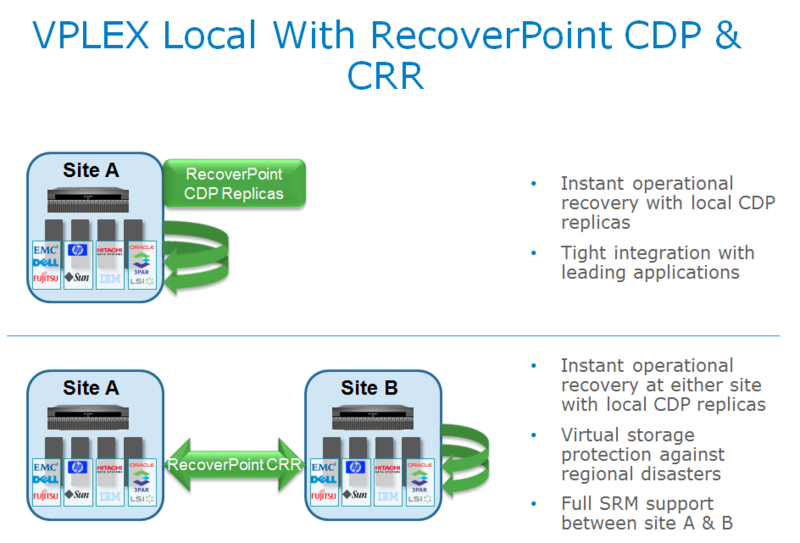 RecoverPoint CRR/CLR enabled Automated disaster recovery on VPLEX Local virtual storage. Fine grained operational recovery capability on VPLEX Metro virtual storage. 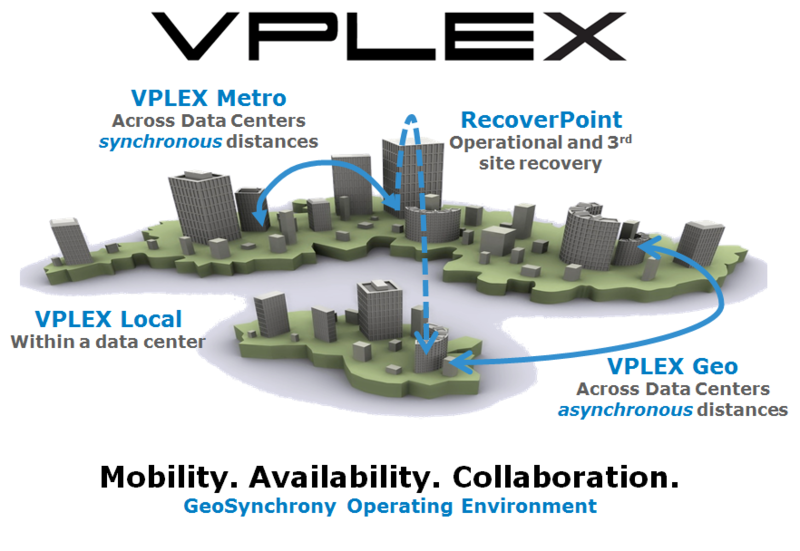 Support of VPLEX Metro enabled load balanced and HA data centers which are separated by synchronous distance and RecoverPoint CRR/CLR enabled protection to an independent site for disaster recovery. 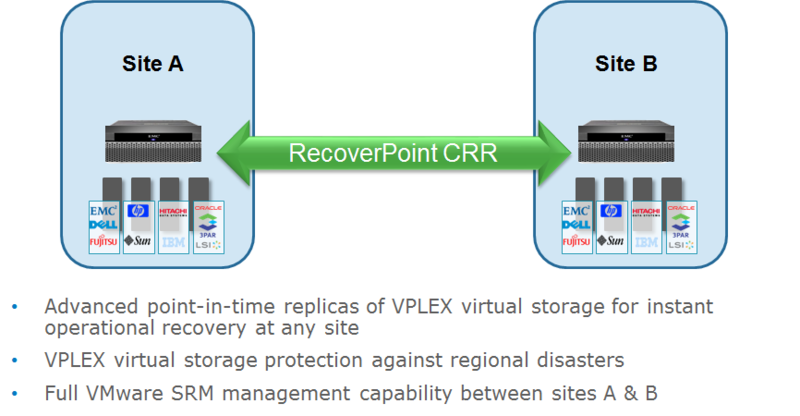 RecoverPoint CRR/CLR enabled Automated disaster recovery on VPLEX Metro virtual storage. 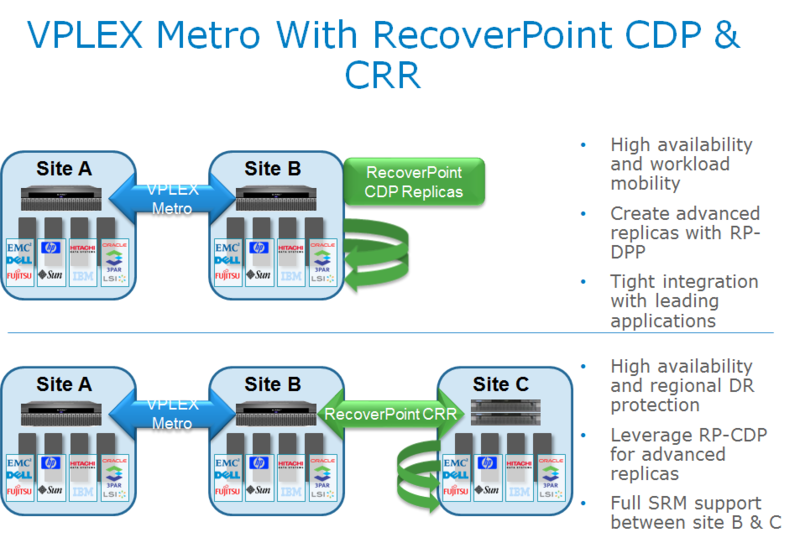 RecoverPoint’s Continuous Data Protection (CDP) capability can be used in a traditional VPLEX Metro configuration to create continuous point-in-time checkpoints of critical data for fast and efficient local restore with a very small recovery point objective when compared to full replicas created every few hours. And, organizations can configure VPLEX Metro between two sites for high-availability and simultaneous data access while also using RecoverPoint Continuous Remote Replication (CRR) to replicate the remote site’s data to a distant third site. This provides the highest level of protection from a regional disaster that might disable both site A and B in this example. 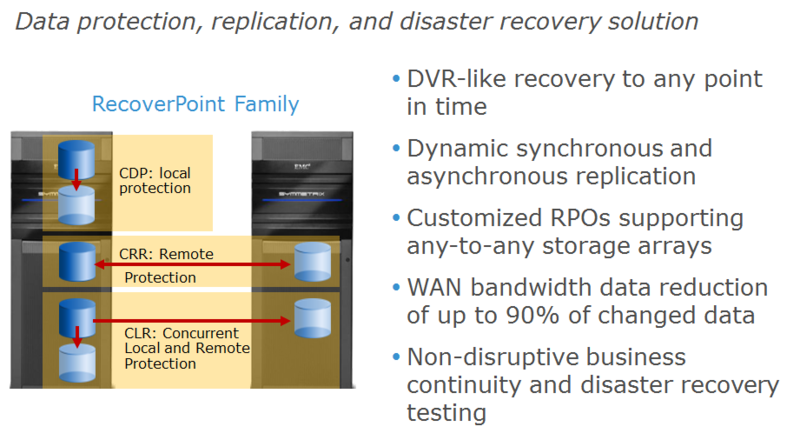 And, coupled with RecoverPoint’s Continuous Data Protection (CDP), local replicas can be made at both site B and C for fast and efficient local restore. 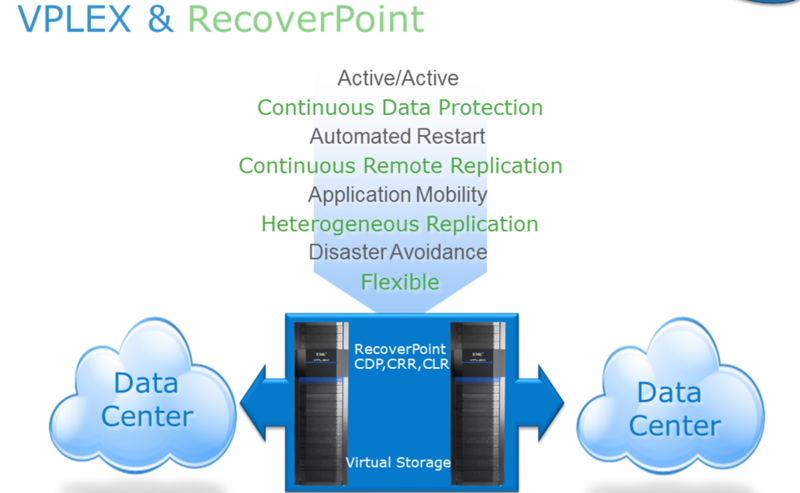 RecoverPoint’s Continuous Data Protection (CDP) capability can also be used in a single-site VPLEX Local configuration to create continuous point-in-time checkpoints of critical data for immediate operational recovery in the event of a data corruption or human error. Recover local restore with a very small recovery point objective when compared to full replicas created every few hours. And, organizations can configure VPLEX Local between two sites for high-availability and simultaneous data access while also using RecoverPoint Continuous Remote Replication (CRR) to replicate the remote site’s data to a distant third site. This provides the highest level of protection from a regional disaster that might disable both site A and B in this example. And, coupled with RecoverPoint’s Continuous Data Protection (CDP), local replicas can be made at both site B and C for fast and efficient local restore. 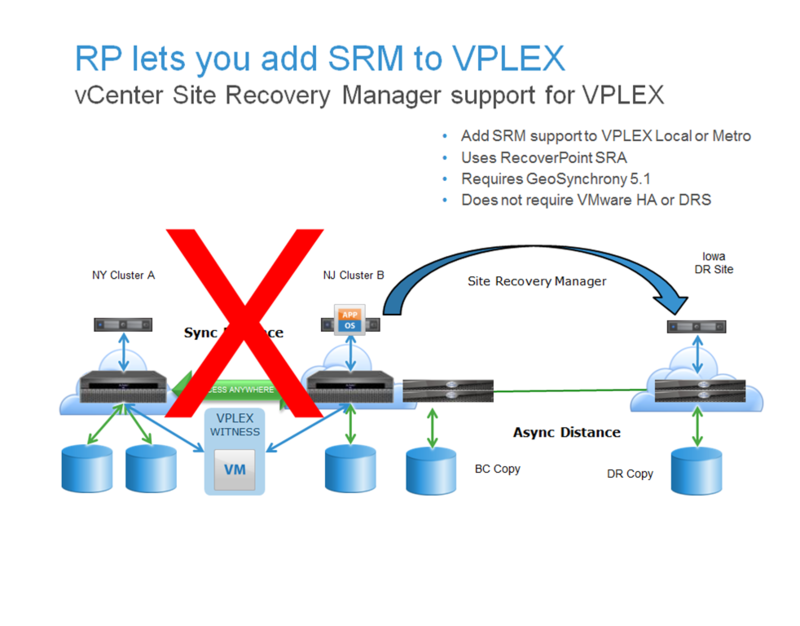 And, RecoverPoint’s CRR capability can be used in a VPLEX Local configuration of site A and site B. VPLEX provides high availability and simultaneous data access while RecoverPoint CRR provides an additional level of disaster recovery. 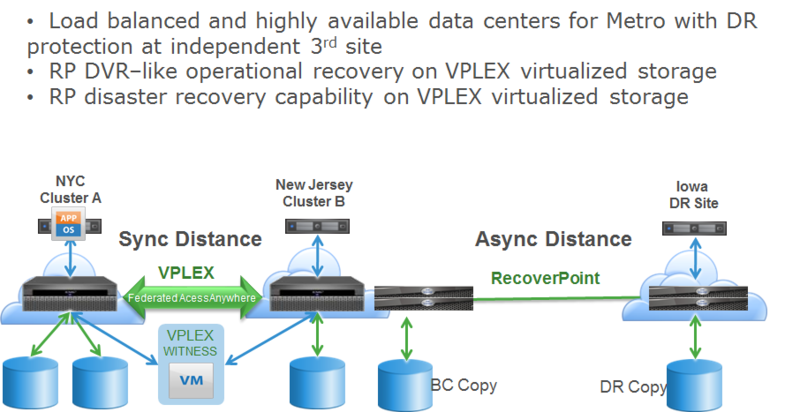 Note that with remote replication, there is a way to move data between separate VPLEX Metro clusters. 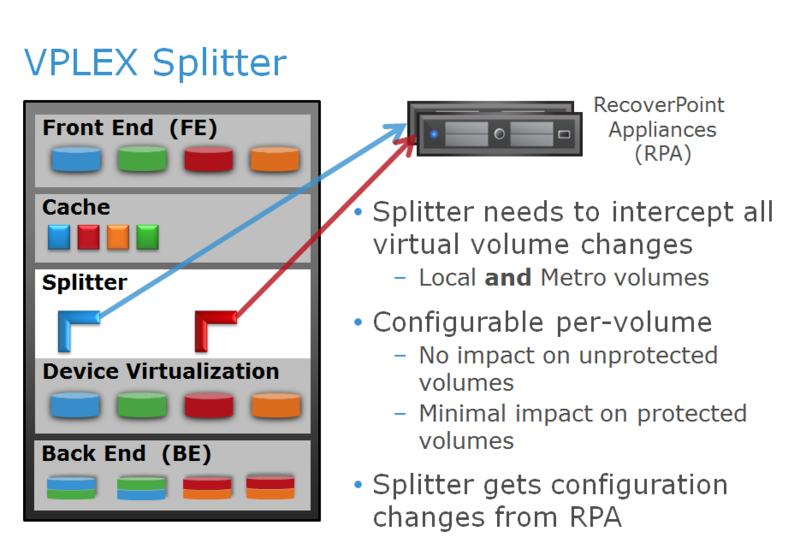 Bulk of replication work happens in the RPA – the splitter is as light-weight as possible, to minimize impact on Production volume I/O path. Could talk to splitter architecture – simple tap on I/O path plus separate process for managing configuration.